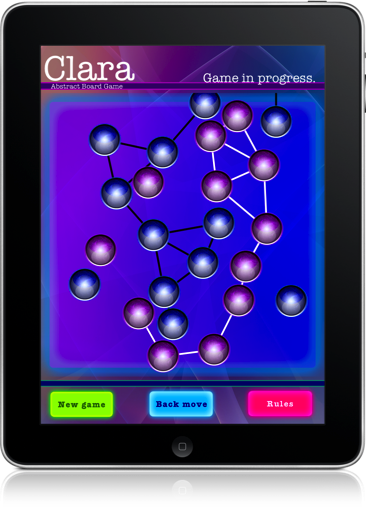 Clara is a new abstract board game. It was invented in April 2010. Goal of game is connect oposite sides of board. It is similar to Hex or Twixt, but in Clara you can freely place stone. 1. Start game and swap rule. First player place blue stone on board. Second player chooses your color of stones. Players take turns placing a stone of their color on board. The goal is connect oposite sides of board: top and bottom sides for blue player, left and right sides for red player. Game is finished when player connect oposite sides of board. Maximum length of connection between two stones is diameter of stone. Clara an absolut new game and strategy is unknown. It was invented in April 2010. Clara takes a few seconds to learn and a lifetime to master. In a few weeks will be online game version implemented on www.littlegolem.net where are hundreds of players of abstract board games.